You’ve spent a lot of time planning and a lot of money booking the vacation you’re about to take (and that’s not counting the vacation days you had to accrue). So packing anything less than style god-level menswear for the trip would be just plain disrespectful. This time out of office is meant to be relaxing, sure, but the clothes you take along for the ride have a very important job to do. They have to perform under the stress of travel, keep you cool in the heat, take you from poolside to bar-side to candle lit dinner-side, and above all, they have to make you look damn good. If you’re in a bit of a style rut and have no idea where to start, you are in good hands. 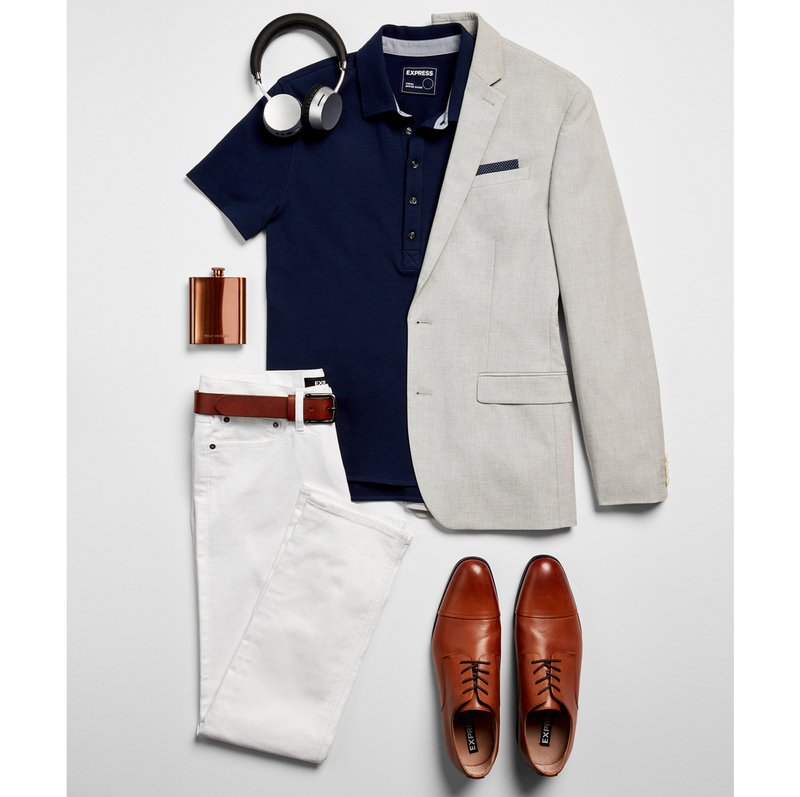 And if you’re doing just fine but looking to turn your style situation up a notch, we’re on your side, too. 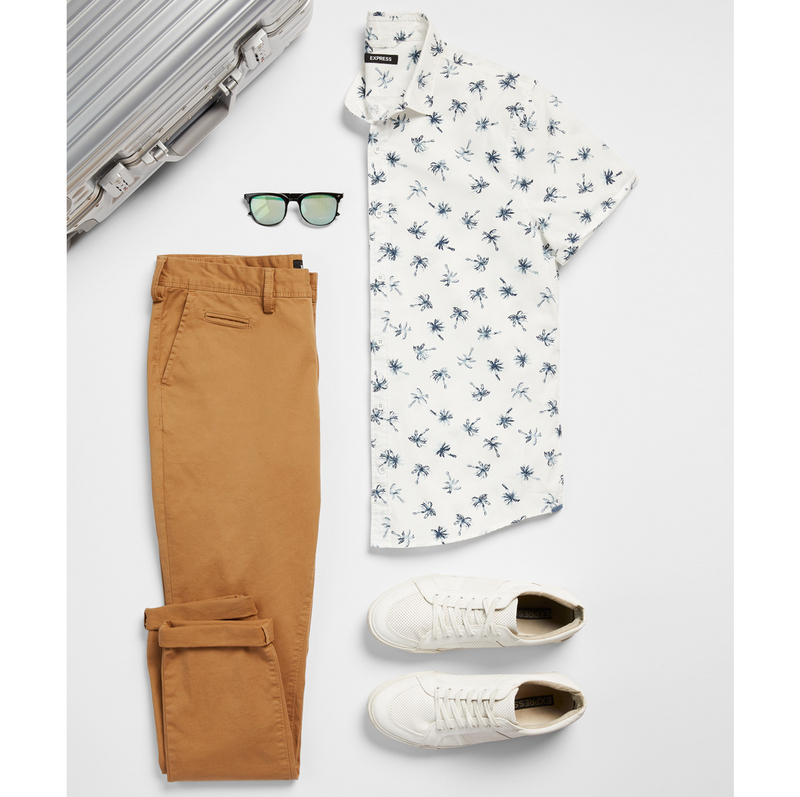 These four suggestions will push you beyond the boring stuff in your closet and propel you to vacation style-stardom. Part of being a style god is wearing a suit even when you don’t have to. That said, the suit you take on vacation should bear little resemblance to your standard navy office kit. Comfort is key while traveling, so it needs to breathe and stretch with you. But it also needs to take a chill pill. 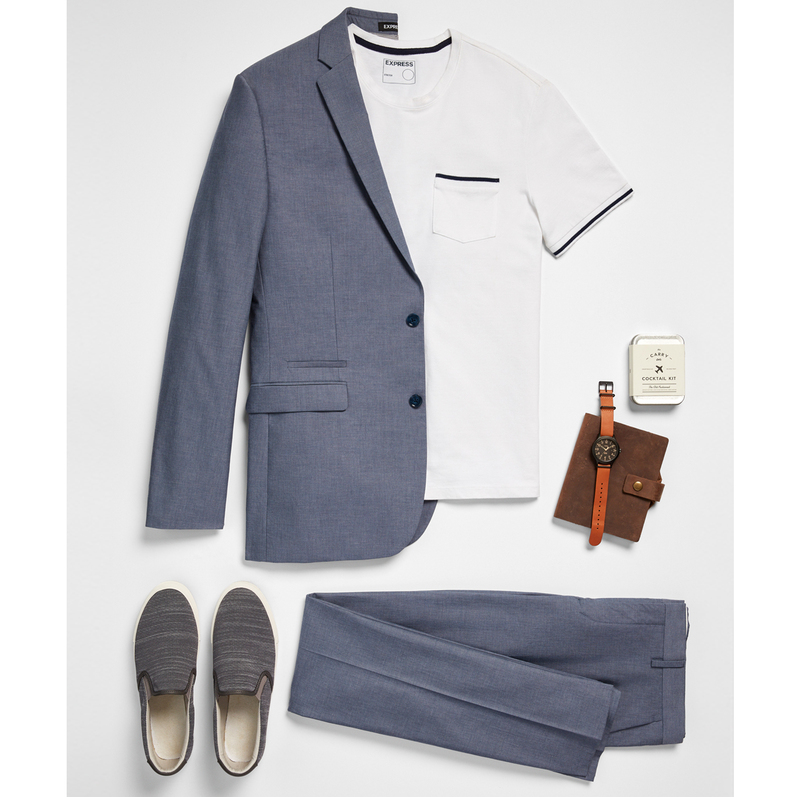 Wear your performance suit with easy going slip-on sneakers and a slim but not tight fitting tipped pocket T-shirt. “Boring” colors like khaki and tan don’t get the love they deserve thanks in large part to ill-fitting chinos often worn with a cell phone belt pouch. But beige and other desert neutrals have a lot of style to offer, so long as you wear them in modern fits and you choose the right size. Layer different shades of tan for a super fresh monochrome look that checks off multiple trend boxes. Now roll up your sleeves and do your best Indiana Jones impression. Ever notice how many stylish famous guys wear white jeans instead of suit pants? It’s been a thing for years now and we see no sign of the trend slowing down. So it’s time you learned this new way of doing suit separates. The combination of slim straight fit, a little stretch, and a fresh pop of white has transformed an old guy look into a “rich guy who owns this restaurant” look. Try it out while you’re away. We promise you’ll look cooler, younger, and actually more dressed up despite how comfortable you’ll feel. Style heroes have no set uniform. Their talent lies in using clothes to play up what’s most attractive and interesting about their body and their personality, too. So use this trip as a free pass to express yourself. 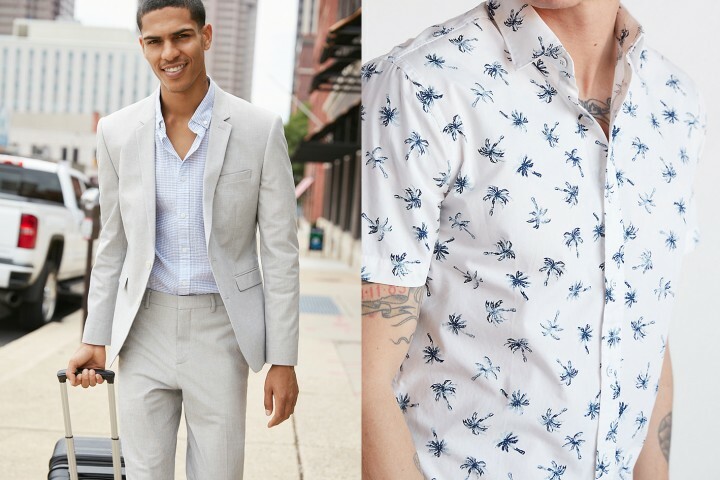 Have you always wanted to try tropical prints or a new style of sunglasses? Are you hankering for a new way to cuff your pants? Or are you finally ready to take the white sneaker plunge? As long as you stick to things that fit you well, we say go for it. After all a little print never hurt anybody. – Instead of folding, roll pants, shirts, and shorts to avoid creases and make the most of precious suitcase real estate. – Opt for analog extras like a handsome watch, a non-phone camera, and actual printed reading materials. All these things will make unplugging from the real world a hell of a lot easier. – Try on your vacation clothes at home before getting on the road. Your goal should be to create distinct outfits while still making sure that every item you take can be mixed and matched with other pieces.